To make entry into Tibet from Kathmandu, you should get your Chinese visa from the Chinese Embassy in Kathmandu (regardless of whether you already have a Chinese visa issued in your country). Please note that if you have already got a Chinese visa at your home country, it will be cancelled and fresh visa needs to be issued in Kathmandu. So do not apply for a Chinese visa until you reach to Kathmandu and avoid waste of money (in the case you enter Tibet from Nepal). However, you need to get your Chinese visa in advance. You are required to have a valid passport to enter Tibet (at least six months validity). In order to get Chinese visa in Kathmandu, please send us your clear passport copy and other details like your profession to us at least 25 days in advance. We will get Tibet Travel Permit (TTB permit or commonly called Invitation letter to travel to Tibet from the Tibet Travel Bureau - TTB). Once you arrive to Kathmandu, we apply for your Chinese visa along with your original passport and TTB permit. You will get a group visa (it will be not stamped in your individual passport but will be in a sheet of paper) very important: The visa issuing days in the Chinese Embassy in Kathmandu are Monday, Wednesday and Friday between 9.30 am to 11 am. In order not to waste your time in Kathmandu, make it such that you arrive to Kathmandu either Sunday or Tuesday or Thursday so that you can get visa the next day and fly to Tibet the day after. (Except the main season, the flights to Lhasa from Kathmandu are generally operated on Tuesday, Thursday and Saturday mornings and almost always get packed). The entry permit (TTB permit, equivalent of a visa for Tibet is required to enter Tibet region of China. A Chinese visa and Tibet entry permit are both required to enter Tibet). You need to show this to the authorities in airport or surface entry points. The Alien travel permit (PSB permit) which is required to travel restricted areas in Tibet. In practice you need PSB permit to travel any regions outside Lhasa. Different PSB permits are required to travel to different parts of Tibet. PSB permits are issued by local police authorities called Public Security Bureau (PSB). You send us the following details exactly as in your passport at least 15 days before the trip departure date. (A) Your full name (B) Gender (C) Date of birth (D) Passport number (E) Nationality (F) Occupation Or, simply send us a clear scan copy of your passport. Please note that mentioning your true profession in the application form is important like journalists, teachers, doctors, businessman, nurses and so on. Government officials, political personnel and diplomats may require more complicated procedures in order to get issued a permit for Tibet. Please note that neither Corsa Nepal Adventure nor any travel agency in Kathmandu sells \"permit-only\" service. One must buy the tour package to obtain the permit for Tibet. (A) Tibet travel permits may be acquired for any travelers, except the following groups of people such as diplomats, journalists, and government officials; who should contact the Foreign Affairs Office of the Tibetan Government in order to arrange a permit. (B) Tibet travel permit is required to buy the air tickets and to show at the airport check-in counter before boarding the flights and upon arrival at the Lhasa airport or surface entry points. (C) Once you are in Tibet, your escorting tour guide is supposed to retain your permit. You may not carry it by yourself, or travel within Tibet with it in your possession. The Alien Travel Permit is required for travel outside of Lhasa. Most of our travel itineraries for Tibet are based on entry from Kathmandu. Even now, Kathmandu is the easiest place to organize Tibet visa / travel permits and flight tickets to Lhasa. Air China operates from Kathmandu to Lhasa three times a week (more flights operate during main tourist season)One way fare Kathmandu � Lhasa is USD530 at present (flight costs are subject to change without prior notice, so please check with us before booking)other places to make entry into Tibet by flight are from Chengdu or Beijing and from Hongkong. Lhasa is now linked with train from the main land China. We also sell tours for mainland cities of China. The circulated currency in Tibet is RMB. Foreign currency can be exchanged in the bank of China in Lhasa and other cities. But only the main offices of Bank of China accept traveler�s check & cash in advance. You can exchange money into RMB according to the exchange rate of that day with your valid passport. If you want to visit remote areas in Tibet, you are advised to have enough RMB with you. However, you can have some US$ with you, too.The office hour of the bank is from 9:00 am to 12:00 pm and 15:00 to 18:00 pm. If you withdraw money with credit cards, you�d better avoid Saturdays and Sundays. Due to its high altitude and climate, Tibet is some-what cold and the difference between temperature in the day and at night is very great. But as for its long sun-shine time, winter is not too bad. Its annual rainfall is not much with the monsoons occurring between July and September. In spring, autumn and winter it is a bit dry. Winter (December-February): Frigid and very dry. Warm pullover, down jacket, woolen sweaters, scarves and gloves are necessary. Traveling to Tibet is an adventure involving high altitude sickness and could be dangerous. While most visitors have only minor effects from the altitude, we advise especially the travelers with known heart or lungs or blood diseases to consult their doctor before traveling. Mild headache, fever, loss of appetite or stomach disorder can take place in the process of acclimatization. In order to have better acclimatization we advise our travelers to drink 4 liter water minimum a day, do not exhaust too much, breathe deep and take rest more than usual. In most cities and counties in Tibet, there are hotels and guest houses for lodging, but the service may be inferior to those of mainland cities of China. In Lhasa, lodging ranges from guest houses to four star hotels. In Shigatse, Gyangtse, Tsedang and Nyingchi, the highest standard is three stars. In Tingri, Zhangmu and Nakchu, the highest are two stars while in other smaller or remote areas, accommodation is mainly in guest houses and service is too basic.Most of the standard rooms of the starred hotels in Tibet have private attached bathrooms with water heaters. The guest houses have own public bathrooms with fixed time service. These days road conditions in Tibet are better with the rapid development of Tibet\'s economy and the strong support of central government. A transport network centered around Lhasa beyond Lhasa has asphalt road, such as the Lhasa area, Tsetang, Nyingchi, Gyangtse town, Shigatse, Chamdo, and so forth. Common vehicles can run on these tarred roads. Only to those remote mountain areas far away from Lhasa land cruisers are used for the smooth passing. 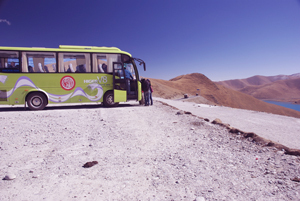 In Lhasa, the main means of transportation is by minibus. There are now regular buses shuttling between Lhasa and major towns in Tibet. Though getting to and around Lhasa is straightforward, transport to those remote mountain areas or other isolated tourist destinations far away from Lhasa, may not be so convenient. Public bus routes are not developed like those in other places on mainland of China. Sometimes, you have to pass through bumpy and dusty roads. In rainy seasons, it will be even much worse. If you are planning to those remote places, a good quality Land Cruiser is strongly recommended. The conditions of minor roads are only passable by jeeps. 4WD plays a main role for Everest Base Camp tour through the rough road from Tingri to Everest Base Camp.